Life by the Creek: Photo Hunt Challenge - All done! Photo Hunt Challenge - All done! I decided to sign up for the August Photo Hunt Challenge. I figured since it was a whole month, it would be easy to get all the required things. It wasn't as easy as I thought. ;) I think I got most of the pics finished the last few days of August! 2. Something comfortable. This is the flannel sheet that's in my tent trailer. It's pretty comfortable, especially on a cool night. 4. Feet. These feet belong to my oldest daughter and youngest son. They love wading in the creek! 6. Culture. Canadian culture definitely includes maple syrup. ;) I really like the dark, maple-y syrup best. 7. Contrast. This is a lump of brown sugar, and chunks of salt. My hubby works in a salt mine, and he brought these home. The chunks of salt are a contrast, too. One is clear, and one is full of dark rock. So, salt & sweet, dark and light. Lots of contrast! 8. An indulgence. We have a lot of allergies in our house. These "Enjoy Life" cookies are a real indulgence! And tasty, too. 11. Something feminine. I did have a pic of nail polish, but I decided to go with my daughter's hair band instead. She wore it to my sister's wedding. 14. Business. This one kills me. It's my youngest son and his best friend/cousin. They hung out in the porta-potty at our family reunion, take care of 'business'. ;) I'm sure they were only squeezing out drops, but it gave them an excuse to go in. 16. Something wet. Rocks in our creek. 17. Something dry. Chalk is pretty dry, right? ;) So is the wood that it's sitting on. 19. Heart-shaped clouds. 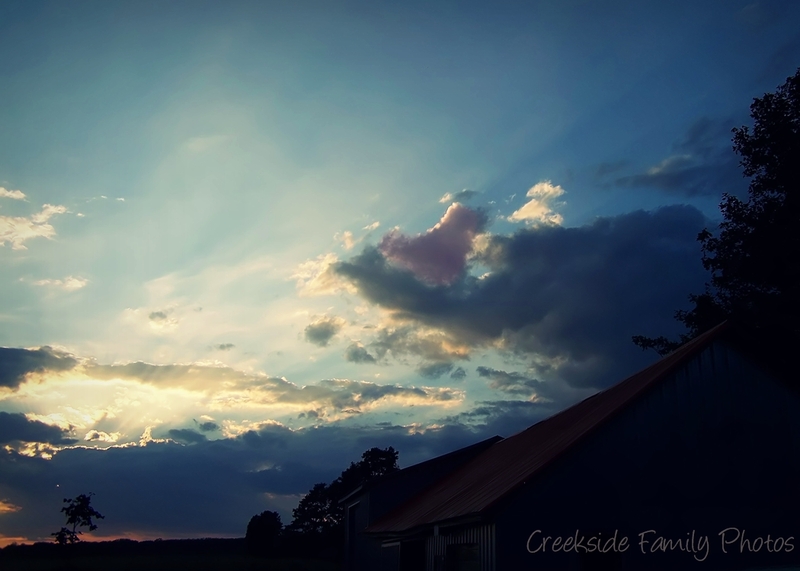 I was taking pictures of a sunset, and once I got it into the computer, noticed one of the clouds looked like a heart! I added a touch of pink to make it stand out. Love this. 20. I had a few ideas for strength, but not enough time. So, this picture of my brothers will have to do. There's a lot of strength there - both physical, mental and spiritual. Love you guys. So there you go! That's my interpretation of this month's Photo Hunt Challenge. Please check out all the links here. I'm currently away on vacation, but I'll be back to check out the other entries next week. Such delightful captures. The feet in the creek is so nice and I adore the eco friendly socks on the line. As a matter of fact I love Love LOVE fresh laundry from the line. Your business had me laughing, but I loved your apple most of all. awesome strength picture... boys are funny sometimes. great pictures, it's fun finding something in a shot or remembering you have something to be used in a shot! Some really cool pics. I love the cloud one, and the heart shaped one and the way you coloured it. I really love your feminine photo though....so pretty! I love your contrast photo! So creative and such and interesting subject. They look like they could be precious gems. I also love the cloud one, just the right amount of coloring to stand out but not look "off." Well done! The business one cracks me up. HA! There are so many great shots...looks like you had quite a good time with this challenge. I love your hearts in the cloud shot. It really is beautiful. Nice work. Great shots! I really love your photo for light! What a wonderful idea! Also, your shot for business cracks me up! Love it! Love the wrench! The angle you caught it at, the depth of field, the texture and contrast. These pictures make me want to buy you your rebel. You are amazing with the camera you have, so i can only imagine how awesome the pictures would be out of a DSLR. love the repetition shot and the chalk! !